Just released on the Unreal Marketplace, Adventure Music Pack 2. Introductory price of $24.99 for a limited time, get future updates for free. • Music perfect for exploring a Mayan temple or traveling down the Nile River. • Music composed using instruments from the Middle East, South American and traditional orchestration. • Main tracks are broken down into sub loops to give the user a broader spectrum of music. • Fading music tracks perfect for game trailers and YouTube videos. • Bumpers and Stingers “additional track versions” perfect for game endings or transitions. Posted on March 7, 2019 by Michael La Manna | Composer Audio Designer and tagged unreal gamemusic seamless loops. Just released on the Unity Asset Store, Game Audio Try Pack. 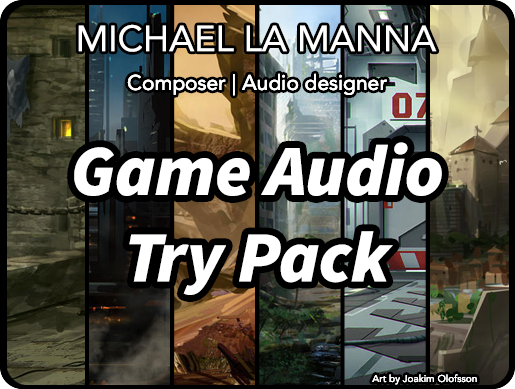 Now you can experience a selection of music and audio design from all my products with Game Audio Try Pack. Posted on March 4, 2019 by Michael La Manna | Composer Audio Designer and tagged gameaudio music sale unity3d gamemusic. 50% off all Fantasy Music Packs for the next 2 weeks. Posted on February 15, 2019 by Michael La Manna | Composer Audio Designer and tagged sale music sale gamemusic unreal. Now on the Unity Asset Store get Epic Adventure Music Pack 2 at the introductory price of $25. Posted on February 6, 2019 by Michael La Manna | Composer Audio Designer and tagged unity3d asset store sale music sale gamemusic. Now on the Unity Asset Store, get all Fantasy Music Packs for 50% off. Posted on January 27, 2019 by Michael La Manna | Composer Audio Designer and tagged unity3d music sale. Fantasy Music Pack 1 & 2 have just been updated with additional content on the Unity Asset Store and Unreal Marketplace. Posted on December 22, 2018 by Michael La Manna | Composer Audio Designer and tagged gamemusic gamedev. Select music packs are now 50% off on the Unity Asset Store. Posted on November 26, 2018 by Michael La Manna | Composer Audio Designer and tagged unity3d music sale gameaudio gamedev. Posted on November 23, 2018 by Michael La Manna | Composer Audio Designer and tagged unreal gamemusic seamless loops music sale udk. Thrilled to be working on the soundtrack for The Repopulation. Posted on October 31, 2018 by Michael La Manna | Composer Audio Designer. Posted on October 11, 2018 by Michael La Manna | Composer Audio Designer and tagged unreal music sale gameaudio gamemusic seamless loops. Below are some demos of Epic Adventure Music Pack 1 used with Uncharted. Posted on October 3, 2018 by Michael La Manna | Composer Audio Designer and tagged music gamemusic seamless loops unity3d unreal epic music. Out now on the Unreal Marketplace, Adventure Music Pack 1. Posted on September 14, 2018 by Michael La Manna | Composer Audio Designer and tagged unreal gamemusic seamless loops. New big band track now on my soundcloud. Posted on September 13, 2018 by Michael La Manna | Composer Audio Designer and tagged big band music tv. Just added additional content to Epic Adventure Music Pack 1 on the Unity Asset Store. Posted on September 2, 2018 by Michael La Manna | Composer Audio Designer and tagged unity3d gamemusic epic music seamless loops gameaudio. Whether your exploring an ancient tomb or traveling down the Amazon River, Epic Adventure Music Pack 1 will set the mood. Combining sounds from the Middle East, South American and traditional orchestration this hybrid soundtrack will fit perfectly with any action-adventure game. The main tracks are broken down into sub loops to give the user a broader spectrum of music. Posted on July 13, 2018 by Michael La Manna | Composer Audio Designer and tagged unity3d asset store music sale gamemusic. What have I been working on for the past 5 months? Epic Adventure Music Pack 1, coming soon to the Unity Asset Store. Posted on July 1, 2018 by Michael La Manna | Composer Audio Designer and tagged music unity3d gamemusic gameaudio. 30% off all music and sfx packs on the unity asset store. Posted on May 5, 2018 by Michael La Manna | Composer Audio Designer and tagged unity3d music sale gamedev. SALE on all music packs! Posted on March 8, 2018 by Michael La Manna | Composer Audio Designer and tagged unreal music sale gameaudio.